Visa Fees and What Else? Know your visa requirements before you go tearing off to a local Consulate or send your passport to an Embassy. Be sure that you have collected all of the information and documents you'll need to apply for your visa. But it is ultimately your responsibility to obtain your visa. And to do that you need to gather the proper information. To find out what the procedure and requirements are for each country you want to visit, check with the Embassy of that country. You can look up basic information on the internet. All governments have pages to help their citizens with information they'll need for travel. Look on your government website and the government sites from the countries you will be visiting to see what visa requirements are for you. When we went to China, it didn't mention a requirement about the passport needing to have 3 months validity after a visit ends. If you are going to need visas, don't wait until the last minute to see what you need to apply for a one. You may have to gather several documents together. You may need information from your bank or your travel agent. You may need visas for more than one country. Does your passport need to be valid for three or six months after your visit ends? Do you need a passport size photo... or two? What is the applications fee? Can you pay the application fee with a credit card? Or do you need cash? Or a Cashier's Check from the bank? ...or a personal recommendation or sponsor? Do you need a copy of round trip airline tickets? Do you need proof of "sufficient funds"? Do you need proof of a hotel reservation or some type of accommodation? Do you need a copy of your Yellow Fever Vaccination Certificate? Will you be applying for a single entry or multiple entries into the country? Which will almost always cost you more, but is worth it not having to work that out once you're on the road. You may also be asked other questions about your health and character and why you are visiting the country. 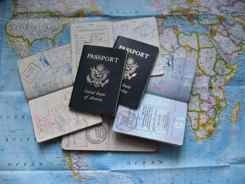 If you will be traveling on business, you may need a different type of visa than a casual tourist will. This may not be a complete list of visa requirements, but these are some of the questions we've come across in our travels. If you plan ahead and gather together everything you will need to apply for a visa.... getting one will go smoothly... and so will your trip.